Ledothamnus sessiliflorus (Ericaceae) is a small, wire shrub found on the summits of the eastern tepui arc in Bolívar state, including Roraima-tepui, where the borders of Venezuela, Guayana, and Brazil adjoin. It grows in rocky, exposed areas over 2400 meters elevation. 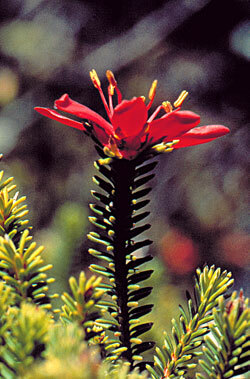 Ledothamnus is one of four genera in the blueberry family that are endemic to the tepuis. Others are Mycerinus, Notopora, and Tepuia.